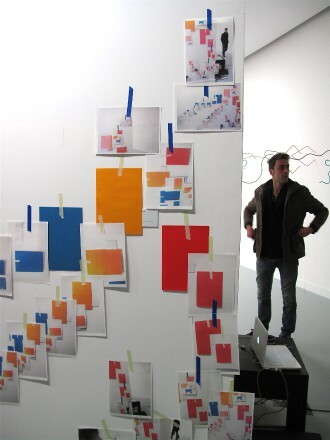 For the occasion of Art's Birthday, taking place at MUHKA, Museum of Contemporary Art Antwerp, NICC is delighted to host LOVE LETTER TO A SURROGATE. Join us at Love Letters To A Surrogate, a one-off event of nineteen ongoing simultaneous performances occuring in real time distributed across and through the institutional and spatial footprint of the Muhka. Instead of one performance following another, on a predetermined single stage, multiple settings and spaces will provide the opportunity for multiple and simultaneous engagements with a wandering and nomadic audience. Here is how the project works. First, artists in Los Angeles who performed a set of instructions in Love Letter to a Surrogate Stage 1 at the Torrance Art Museum and a few others who wanted to be a part of it, write a set of instructions for participating artists in Belgium. As such the artist in Belgium reenacts or acts as a surrogate to reproduce an action/performance that the asking artist could have performed himself or herself had they been in Antwerp. 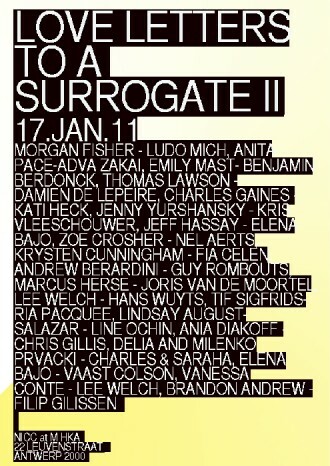 The selection of Belgian Artists for LOVE LETTER TO A SURROGATE stage II was a collaboration between Warren Neidich en Lode Geens. Three underlying conditions formed the unconscious of the project. It was hoped but not a prerequisite that artists would ask artists across generations. That a conversation or correspondence would take place between artists and that these would be saved and sent to the MUHKA in Antwerp via the internet or fax where they would be printed and archive. The strong connectivity to similar practices found in Conceptual Art and Fluxus would be acknowledged and provide food for thought.